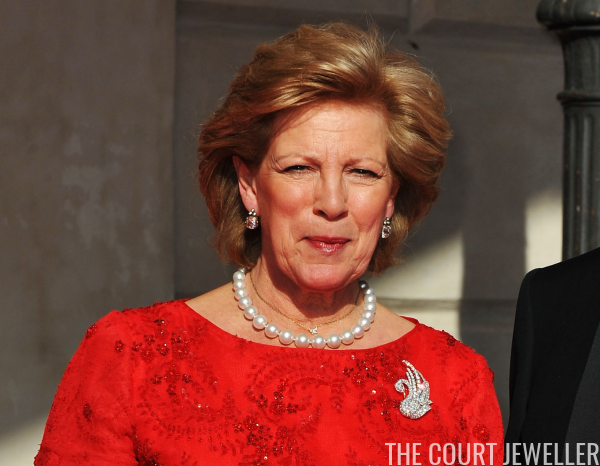 We're continuing to pilfer through the jewelry box of our Magpie of the Month -- Queen Anne-Marie, who was once Queen of the Hellenes -- and today, we've got a look at her glittering diamond brooch in the shape of a swan. Little information appears to be available about the brooch's provenance, but it seems to have some significance for Anne-Marie, as she has worn it for some major events. Above, she wears the swan for the christening of her younger daughter, Princess Theodora, in London in October 1983. And here, she dons the brooch for the wedding of her eldest son, Crown Prince Pavlos, in July 1995. 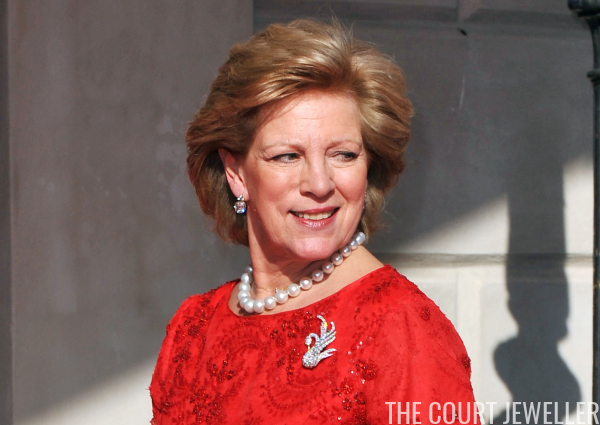 Five years later, Anne-Marie wore the brooch with the necklace she inherited from Queen Alexandrine for a gala dinner for the Prince's Trust in London. In 2010, Anne-Marie brought the brooch with her to Sweden, where she wore it for the pre-wedding concert held in honor of Crown Princess Victoria and Prince Daniel. The bright red dress she wore the brooch against on this occasion really helped to set off the brooch's details. 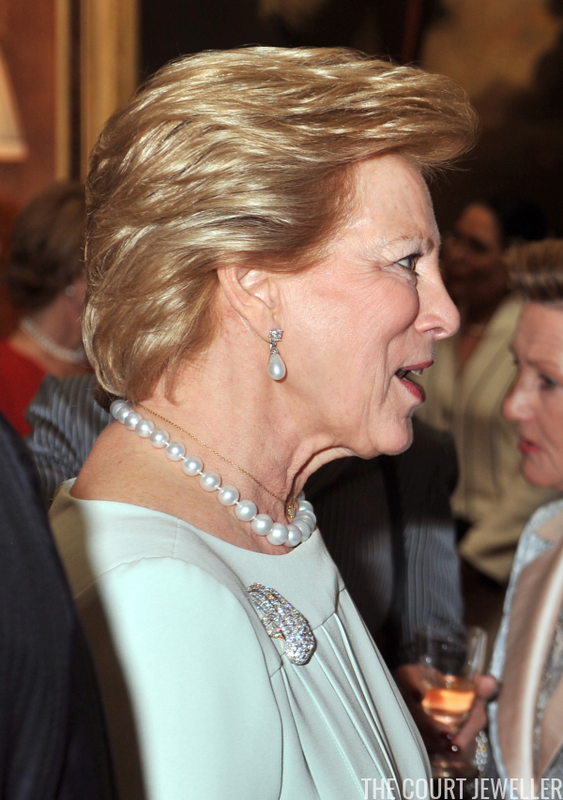 Anne-Marie has also innovated with the brooch's placement, wearing it at her waist for one of the events during the 2012 Ruby Jubilee celebrations of her eldest sister, Queen Margrethe II of Denmark. 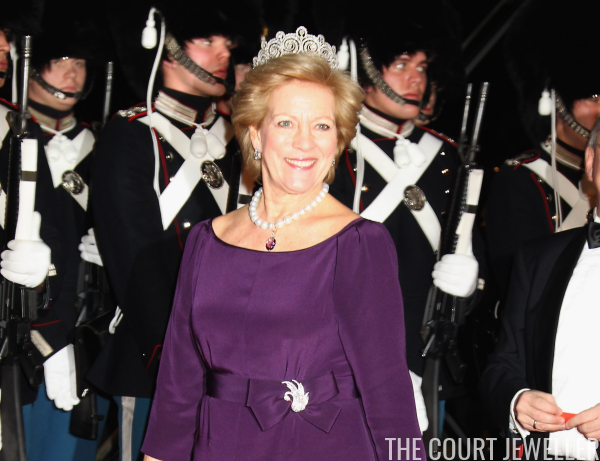 On this occasion, she paired the brooch with an important Danish diadem: the Khedive of Egypt Tiara. 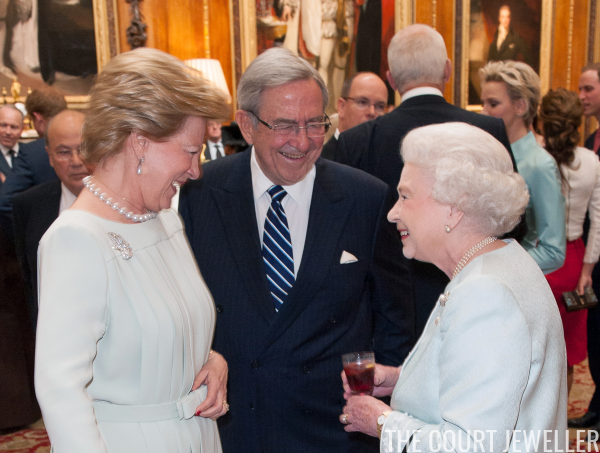 The brooch managed to sparkle against a more neutral color palette when Anne-Marie wore it for the grand Sovereigns' Luncheon during Queen Elizabeth II's Diamond Jubilee in 2012. This profile angle gives you a nice idea of the size and heft of the brooch -- and of the extreme sparkliness of its diamonds!